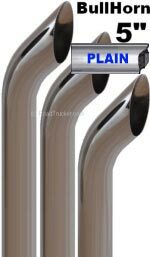 RoadTrucker’s offers Chrome Exhaust Truck Stacks made by American Chrome, that are High Quality SuperPremium Stacks with Triple Nickel plating and double Chrome plating for a brilliant and beautiful shine. 5" Stacks from 18" to 60". 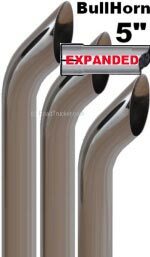 RoadTrucker also carries a line of 6" Chrome Truck Stacks. Yes, American Chrome Manufactures High Quality Stacks. We fully realize their are companies who charge up to 4 times more than American Chrome does. One company actually sells knock offs of American Chrome's stacks. We found several of their retailers on the Internet. You do not always get what you pay for. Sometimes you pay way to much for less quality. Please Note: The Expanded ends are aout 4" in length and about 1/8" difference in size and made to fit over the outside of a 5" Stack.